Clara was born at 12:58pm, Sunday 29th of June, 2014. It was a very different labour to Alby, and gave me the restorative birth experience I had hoped, but never completely believed, I’d get. Before I tell the story of my recovery, I just want to say how overwhelmed I am by the response to the first part because it has completely reaffirmed my decision to share. Thank you everyone. The one fear I couldn’t overcome was that it would all happen again. Of course, it could never be the same, because that doctor was never coming near me again, but the fear remained. In one of my sessions with Paul, he asked me to write down all the things I had done to make sure that Clara’s birth would be different, and the list was a real revelation. I had different people caring for me, I had different expectations, and I made it very clear to all involved how I was to be treated. One of the most meaningful differences though, was having our photographer. We only have one photo from Alby’s birth, and I hate it. It manages to capture all of my pain and distress, and none of the joy. This time, Melissa Jean would be taking photos that would capture the whole experience, one that reflected how hard we’d all worked. I had an appointment with Josie, my midwife, on Tuesday June 24, and my fear and apprehension was starting to get the better of me. I’d had my final pep talk from Paul, I knew that birth was imminent, and there was going to be no way of avoiding it! I was 38 weeks pregnant, the size of a small bus, and denial wasn’t cutting it anymore. To make things more challenging, I also had a self-imposed timeframe, as my obstetrician was going on holidays Friday. Alby was born at 39w, but I thought I might be pushing my luck trying to convince Clara to come by 38+4. Josie, as always, was gentle, thoughtful and reassuring, and I left her with a plan, and feeling a lot more positive. The next day I had my last appointment with my obstetrician. I asked for an internal, which I wouldn’t normally even consider, but I needed either hope that I’d have her before Friday, or the time to get comfortable with the idea that I’d have a different obstetrician caring for me. I was ecstatic to hear that at 38+2, I was 2-3 cm dilated. I went home, and that night, started having a show. I was pretty excited – I had a show the day before I went into labour with Alby, so was pretty hopeful I’d make the deadline. Brett took Thursday off work, and then Friday. I’d been having episodes of regular contracting, but they’d fizzled away to nothing. By Friday afternoon I was in tears – I wasn’t going to have my obstetrician at Clara’s birth. 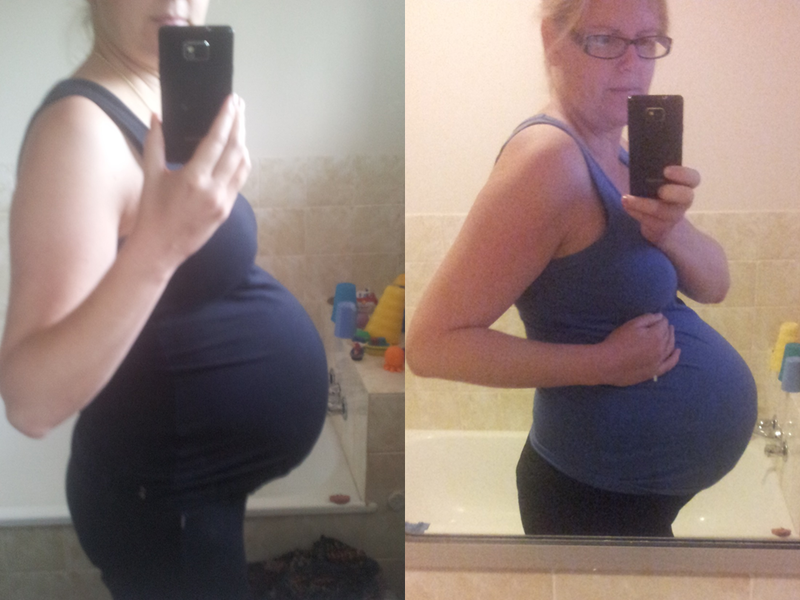 My focus then shifted to the opposite – not starting labour until my back up obstetrician came on call, Monday morning. Of course, when people plan, God (or in this case, the Birth Fairy) laughs. I was asleep in front of the television at about 9pm Saturday night, and woke with a start, knowing my waters had broken. Thank goodness for leather sofas. I think this was the point where my preparation really started to show – I wasn’t scared or anxious, but instead, quietly excited, and ready to face what was coming. I wasn’t feeling any contractions, so I called the hospital, messaged Josie, put on my ‘calm’ playlist, and went to bed. I knew from my last labour that I needed to be as rested as possible, so figured that while I wasn’t having surges, I should sleep. That playlist was a game changer. I had been meditating and visualising Clara’s birth for months, and I firmly believe that it set the tone in my mind for labour. There has been great results using meditation to treat American veterans with PTSD, and I thoroughly recommend it, especially for people who suffer nightmares and insomnia. I slept well, except for the hour I spent online shopping at Pumpkin Patch – oops. I was steadily losing amniotic fluid, and by morning was quite surprised by the change in my belly shape. One of the midwives from the hospital, Bridget, called to check how I was going – they had expected to see me during the night. Josie texted as well, and since I wasn’t contracting, we decided to catch up after she’d dropped her family at church, about 10am. My parents arrived around 8:30 am, and took Alby for a walk. Josie arrived, and I did get a bit distressed, worried about losing my composure and having a panic attack. We talked about that being ok, and then we decided we needed to determine where Clara was, as my membranes had ruptured more than 12 hours previously. I laid on the sofa, and Josie palpated my belly. Clara had moved, and instead of being 3/5 down, as she had been for weeks, she had completely disengaged from my pelvis. She was in the wrong spot, which is probably the reason I’d had no consistent or reliable contractions, and explained my strange belly shape. Josie was a little concerned, as we now had a real risk of cord prolapse, given the loss of fluid. After talking to Mary, another midwife I’d been working with, we decided that the best place to be was hospital, where we could focus on moving the baby into a better position, with the advantage of monitoring, and the availability of a theatre if the worst eventuated. I was upset by this strange turn of events, because I had planned to labour at home for as long as possible. However, with a bit of time to think, I was also at peace to some degree. This was a decision that would be made for the right reasons, and with my full understanding and consent. Of course, it wasn’t how I’d envisioned Clara’s birth at all, but at that point, I was able to channel my anxiety, and instead focus on the fact that we’d be meeting Clara pretty soon. Saying goodbye to Alby was difficult. I knew that I was saying goodbye to him as my only child, and that from that moment on, I was going to be a different mother to him. Josie left for the hospital and we weren’t too far behind. We weren’t really in a hurry, but there was definitely a sense of urgency. It’s only a 15 minute drive, but we had to pass our local shopping centre, which was always busy and slowed traffic down. As we drove past, we bounced over some new roadworks, and in that moment, everything changed. I felt Clara’s head shift, and move very low into my pelvis. I then instantly felt a strong contraction, so strong I wasn’t really prepared for it. Sitting became very uncomfortable, and I was truly surprised. I tried to explain what was happening to Brett, and I think he was a shocked as I was. I had two more contractions on the way, and had to wait for the last one to finish before I could get out of the car at the hospital. Josie was just heading to the door, and was pretty surprised when she saw me. We were heading straight for the maternity unit, but the next contraction arrived before we got there, and I ended up doubled over the front reception desk. This one was stronger than the others, and I remember Josie commenting on how good I sounded. Once that one was done, it was a mad dash for the maternity unit door – less than 5 meters away! I didn’t make it, only getting to the other end of the reception desk before another surge arrived – about 5-8 seconds later (yup, seriously that close together!). Believe it or not, these were only my 4th and 5th contractions. This craziness continued as we made our way, very slowly and with lots of strong and frequent contractions, into the unit. Plans to take me into a room quickly changed, and I continued to contract to the birth suites. I’d already asked for gas, so by the time I got there, it was ready to go. I’m so glad gas works for me. Josie had gone ahead, and the bath was already running. I knew I had to get on the bed for some quick checks first, so as soon as the next contraction subsided, I climbed up. Tracey, the hospital midwife, quickly palpated my stomach, finding Clara 5/5 down, and ready to go. She then got out the doppler, and miraculously, no prolapse. Tracey wanted to do an internal, but I wanted to ask Josie, who had ducked out for a minute. I then felt Clara’s head descend a little more, and told Tracey there was no need for an internal – I knew exactly where she was. While I was resting between contractions, I remember telling Josie that Clara was coming the way she was supposed to, a way that would repair the hurt of the past. That was so meaningful to me, and one of the many special moments I’ll treasure. I got into the bath, but not before doing a little cheer and fist pump – I was almost fully dilated after no more than 20 minutes of labour, and everything was going perfectly, brilliantly. The bath was lovely, and there was a lot of my labour I really enjoyed. I remember telling Josie that there was a picture of an ecstatic mother in Ina May’s book, and that’s how I felt too. I know I was smiling and just so happy, even during contractions. I could feel how different this birth was, and it was just incredible. The joy of a new baby was exponentially multiplied because I finally believed that this was going to be different. I was so excited when it was time to push, full of energy. It was hard going though, and we now know it was because my pubis symphysis was struggling to stretch properly. At one point Tracey held up a mirror, and I could see a beautiful little head emerging. It still took me a couple more pushes, but eventually I got to that point of no return, and her head was out. I hadn’t felt the ring of fire, and actually had to ask if her head was out. Next contraction, her shoulders came through, followed by the rest of her body. I was even able to reach and lift her to my chest, with Tracey and Josie’s help. To be able to be so present in Clara’s birth that I could help catch her was the pinnacle of my imagined birth experience, and to achieve that was just magic. I remember saying ‘I did it!’ over and over again. 90 minutes after the bump in the road, I was holding my baby. I will treasure Melissa’s photo for the rest of my life, because that moment changed my life, and was the reward for the constant effort I made to recover. Clara hadn’t managed to expel all of the mucous and fluid from her lungs when she was born, and so even with lots of rubbing and blowing in her face, she wasn’t able to breathe. After a minute or two, Tracey clipped the cord, and gave Brett the scissors. She took Clara to the resuscitation bed, and Brett went with her. All of a sudden it seemed like there was a dozen people in the room, but I never felt scared. Josie stayed with me, and I watched everyone working on Clara, calling out to her, encouraging her to breathe. I think it says a lot about the effort hospital staff made to make me feel comfortable, because I never feared for her. It wasn’t long before we heard her crying, which was wonderful. I was given a shot of syntocinon in my arm, and Brett and Josie helped me out of the bath and onto the bed. I just remember my legs felt like jelly. Clara was placed in my arms, and she was so beautiful. She was completely different to Alby, and it felt amazing to have her on my chest, and to have pain gone. 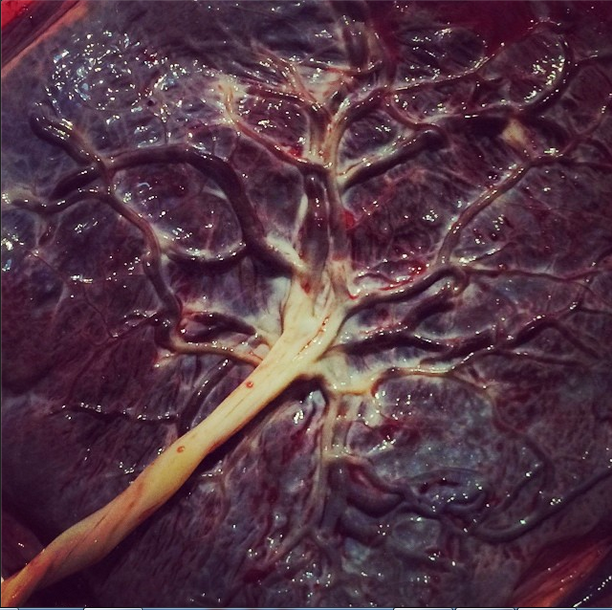 I knew I still had to deliver the placenta, but for some reason, I really didn’t want to. Of course, that wasn’t an option, and when Josie told me it was time to push it out, I did. There was no pain, and it came out gently and easily – again, such a contrast to Alby’s birth. I ended up with a second degree tear, which the obstetrician, who was one I hadn’t managed to meet and develop a relationship with, repaired so well. He was incredibly respectful of everything I’d written in my birth plan and was like a ghost in the room, not crowding me, and making me feel completely in control of everything that happened. I am incredibly grateful to him for that. I later found out that when he was told that I would be delivering on his shift, he was more than a little nervous! And then it was done. The years and months of preparation had led to an outcome even better than I had let myself dream possible. Three months later, I look back on that day and know it was the most important day of my life. I worked so hard to make that moment possible, and was rewarded with not only my beautiful daughter, but I also got myself back – a stronger, more determined version of myself. Instead of dwelling on why something so awful happened to me, I can now answer ‘Because I Can!’. I can cope, I can recover, I can succeed, I can do anything! I am so grateful that Brett was nothing but supportive, even when it was so hard for him as well. I know I wouldn’t be where I am today without him. I don’t see myself as especially brave or courageous, because in my eyes, recovery wasn’t a choice. I had a wonderful husband who deserved a healthy wife, I had a son who needed two healthy parents to guide him, and there was a baby that needed to join our family. I just had to get better, end of story. And yes, #3 is on the cards.